Nez Perce Archives - Go Northwest! South of the small community of Anatone and the wheat fields, SR 129 passes the 792-acre Fields Spring State Park on the east side of the highway. This is a camping park providing views of three states and the Grande Ronde River from Puffer Butte. 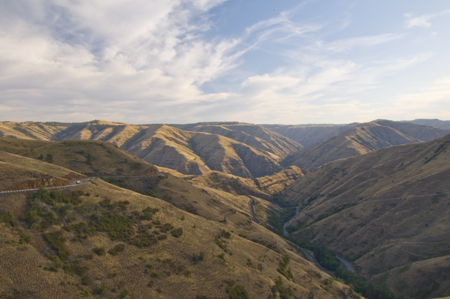 Beyond the park, the highway soon begins a steep descent down a narrow canyon loosely following the course of Rattlesnake Creek to the Grande Ronde River as seen in the photo below. Looking south at the highway descending numerous switchbacks. Numerous viewpoint pullouts along the way provide opportunities to stop for photos and take in the splendid views. Across the river, the highway begins a twisting upward climb through the distant canyon seen in the above photo and becomes Oregon SR 3, the Enterprise-Lewiston Highway, at the Oregon border. Once out of the canyon, the highway seemingly flattens and runs south almost straight as an arrow to Enterprise, Oregon and the beautiful Wallowa Valley. Along the way it flows through a forest corridor and runs by a pullout that is the Joseph Canyon Viewpoint. The elevation along here, surprisingly, is more than 4,000 feet with a high point of 4,693 feet as announced by a summit sign in the proximity of the intersection of Day Ridge Road. Having driven a distance of slightly less than 90 miles from Lewiston, we enter the Wallowa Valley with a backdrop of the magnificent Wallowa Mountains in the distance. This entry was posted in Nez Perce, Oregon, Pacific Northwest, Tours, Washington and tagged Anatone, Fields Spring State Park, Grand Ronde River, Hells Canyon, Hells Canyon Loop Tour, Joseph Canyon on September 4, 2009 by Jack High. Lewiston, Idaho is one of my favorite places for many reasons including climate (particularly in the winter), the amazing topography and the proximity to the Clearwater and Snake rivers and Nez Perce country. 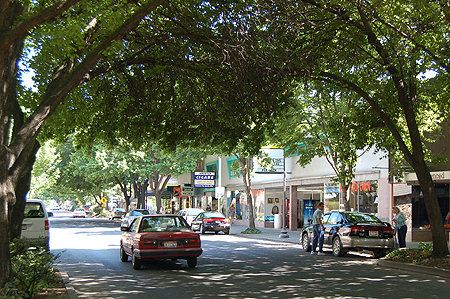 I also particularly like the tree-lined, shady streets of the older part of town in preference to the much newer suburban-like developments anchored by the big box stores seen almost everywhere across America. Also, there is much to do in the area including history, culture, museums and scenery. I enjoy learning more about the history and people of the Nez Perce Tribe, the Nez Perce War, Gold Mining, and the Lewis and Clark Expedition. I also enjoy exploring Hell’s Canyon and visiting the campus of the Lewis-Clark State College and the visitor center at Hells Gate State Park. Unfortunately on this trip, we were running late, the afternoon sun was far too close to the horizon and we had another three-hour drive ahead of us. This entry was posted in Idaho, Nez Perce, Pacific Northwest, Tours and tagged Hells Canyon, Hells Canyon Loop Tour, Lewiston, Snake River on September 4, 2009 by Jack High. Our first stop in the Lewiston area was to visit a spot along the Clearwater River just a few miles east of the city off US Highway 12 to begin our tour of the Nez Perce and Hells Canyon country. The spot is the location of what is now known as the Spalding Site, one of 38 sites that make up the Nez Perce National Park, which was established in May 1965. Though the park is managed by the National Park Service, the Nez Perce Tribe is one of the key partners in governing the park. Tribal members work at the park and the Tribe is consulted whenever a major park project is undertaken. The Spalding Site, located just minutes east of downtown Lewiston, Idaho along US Highway 95 (See Google map) and the Clearwater River, is named after Henry and Eliza Spalding who founded a mission in this area to the Nez Perce in the late 1830’s. The center piece of the site is the Visitor Center where one can learn the story of the Nez Perce people through visiting with National Park Service staff, videos, books and the excellent museum containing thousands of artifacts including a number that once belonged to Chief Joseph (March 3, 1840 to September 21, 1904), chief of the Wallowa band of the Nez Perce. 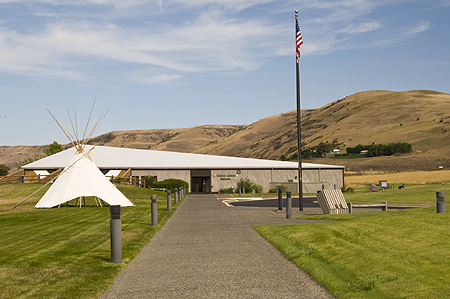 For more information on the Nez Perce and the Nez Perce National Historical Park, visit the park’s web site. This entry was posted in Idaho, Montana, Nez Perce, Pacific Northwest and tagged Chief Joseph, Lewiston, Nez Perce on September 4, 2009 by Jack High.